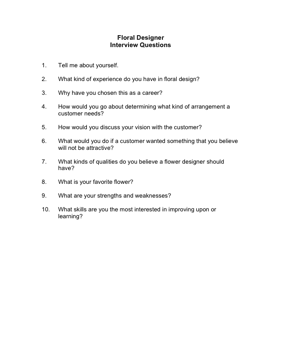 Choose your next Floral Designer with the aid of these helpful interview questions. 2. What kind of experience do you have in floral design? 3. Why have you chosen this as a career? 4. How would you go about determining what kind of arrangement a customer needs? 5. How would you discuss your vision with the customer? 6. What would you do if a customer wanted something that you believe will not be attractive? 7. What kinds of qualities do you believe a flower designer should have? 8. What is your favorite flower?